The concept of intertextuality has proven of inestimable value in recent attempts to understand the nature of literature and its relation to other systems of cultural meaning. 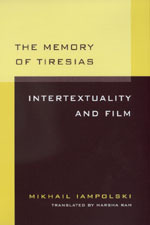 In The Memory of Tiresias, Mikhail Iamposlki presents the first sustained attempt to develop a theory of cinematic intertextuality. Building on the insights of semiotics and contemporary film theory, Iampolski defines cinema as a chain of transparent, mimetic fragments intermixed with quotations he calls "textual anomalies." These challenge the normalization of meaning and seek to open reading out onto the unlimited field of cultural history, which is understood in texts as a semiotically active extract, already inscribed. Quotations obstruct mimesis and are consequently transformed in the process of semiosis, an operation that Iampolski defines as reading in an aura of enigma. In a series of brilliant analyses of films by D.W. Griffith, Sergei Eisenstein, and Luis Buñuel, he presents different strategies of intertextual reading in their work. His book suggests the continuing centrality of semiotic analysis and is certain to interest film historians and theorists, as well as readers in cultural and literary studies. Mikhail Iampolski teaches in the departments of Slavic and Comparative Literature and Russian Studies at New York University.